The planetarium at Eastern Mennonite University – for many of those whose history with the school predates 2007, the words bring up many emotions and fond memories, whether those memories are of the original building on Vesper Heights (also known as “The Hill”) or the M.T. 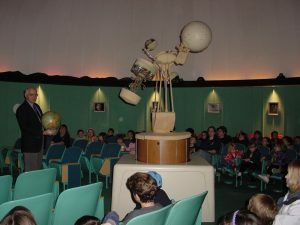 Brackbill Planetarium in the Suter Science Center. The Vesper Heights Observatory under construction in 1938. But the roots of the planetarium run even deeper, hailing back to a group of students and Professor Brackbill, circa 1930, on the roof of the Administration Building. Brackbill, who had a master’s degree in astronomy, was a science, math and English professor, registrar, dorm hall manager, chorister and athletic association president during his decades of service to EMC – from the school’s founding in 1917 to his retirement in 1956. In the early thirties, he founded the Astral Society – a group of students who gathered on top of the Ad Building to watch the stars. An “Astralite” was a member who could name all the constellations and 90 stars. 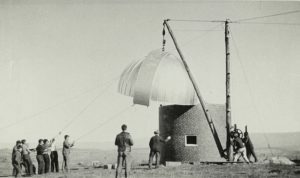 The Astral Society, along with the class of 1938, raised funds to build the Vesper Heights Observatory on top of “The Hill” (the white-domed, cylindrical building still exists adjacent to the Discipleship Center). Brackbill called the observatory, equipped with a six-inch refracting telescope, an “enviable little sky port where the star rays land and you take off.” However, the metal dome did not open or pivot easily, and the space was converted into a 22-seat planetarium in 1946. The telescope was moved outside. At that time, planetarium projectors were rarely found outside of metropolitan areas. Brackbill’s friend, Armand N. Spitz, set out to change that. He created the Spitz A-1 star projector, a hand-cranked device with twelve pentagonal sides for displaying stars on a domed ceiling. EMC received the very first Spitz A-1 created; Princeton bought the second. Professor Emeritus John Horst and Ruby Lehman, wife of the late Professor Robert C. Lehman, both remember Brackbill’s creative nests of wires and devices. “Brackbill was known for rigging up many special effects,” says Horst. “It wouldn’t pass a fire code now!” Ruby says. 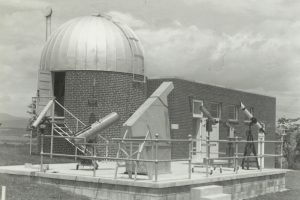 The observatory with the “Astral Hall” 1955 addition, which eventually was used as WEMC’s studios. The radio studio is still in use. Ever inventive, Brackbill also created an “Astra Guide” for his wife, a rotating chart which reveals what is visible in the Northern Hemisphere sky on a given date. The chart and Spitz A-1 are both on display in the Science Center foyer. In 1955, the Astral Hall was built. The terraced one-room building next to the observatory hosted astronomy lectures and Astral Society meetings. (It eventually became the WEMC studios.) In 1956, Brackbill retired, and Lehman was hired to take his place on faculty and as planetarium director. 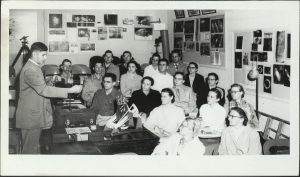 Professor and planetarium director Robert Lehman teaches a class in 1958. After assuming directorship, Lehman used the Vesper Heights vantage point to sight the Soviet satellite Sputnik in 1957. With 11 students and faculty dressed in surplus navy coats against the cold, they took shifts looking into a row of monocular stations lined up along the north-south meridian. Their lenses were tilted at various angles to provide a certain altitude and longitude reading when the satellite came into view. EMC radioed in the second observational fix in the U.S., part of a large network of sightings used to establish Sputnik’s orbital track. Lehman took two breaks from directing the planetarium to finish his master’s and doctoral degrees in biophysics at Penn State, during which John Hershey and John Horst acted as interim directors. Professor John Horst composed and played music to go along with his presentations. In 1968, the Suter Science Center was completed. Lehman was a major contributor to the design, according to Horst. 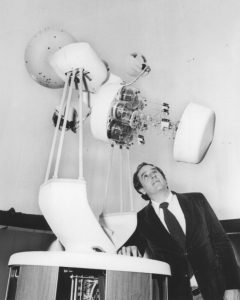 The new building included the Brackbill Planetarium, which could seat 80 people, and a more accurate, spherical Spitz A-4 star projector. Tiny holes in the metal sheeting on the inner dome surface “gave you more of a starlight feel,” says Horst. Lehman had many assistants – physics majors helped give presentations, his son Jim helped install equipment, and the D. Ralph Hostetter Natural History Museum helped attract patrons. In the 1980s, Marijke Kyler, a professor in the Literature and Language department, assisted with school group programs. Joe Mast, “a very competent professional astronomer” according to Horst, took over the program in 1986, continuing to bring in thousands of children and adults to learn about the stars. In 2003, he installed a new 10-inch digital Meade telescope in the Vesper Heights observatory. John Horst took over the planetarium in 2005 when Mast retired, adding “some meditative cosmic space music” which he performed on a synthesizer to welcome visitors before the presentations. Professor Joe Mast hosts a program at the Brackbill Planetarium. By 2007, the 40-year-old Spitz A-4 projector had mechanical problems that would have been costly to fix or replace. Besides, Horst was retiring, with no prospective astronomers on the faculty to continue the programming. The planetarium closed. Horst, Mast and Lehman gathered at a farewell reception to tell stories from their decades as Mennonite ambassadors to the heavens. The site of the former planetarium continued as a popular learning destination for thousands of school age children and other visitors. Professor Jim Yoder, director of the D. Ralph Hostetter Natural History Museum, proposed that the planetarium become a Discovery Room. In 2008, the auditorium seating was replaced with carpet, tables and chairs; the star projector was lowered into storage, and fossils, rocks, animal skins and aquariums took center stage. On the platform over the top the star projector, a taxidermied Alaskan Kodiak bear roars, courtesy of head softball coach J.D. McCurdy. Science center renovations beginning in 2015 required the natural history museum’s main room to be emptied. 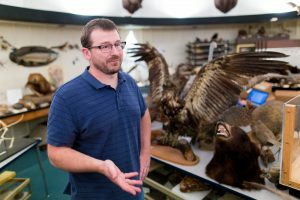 The Discovery Room became museum storage, and currently hold more than 2,800 specimens. The space will be updated in the course of Suter West renovations, with the iconic dome and cylinder remaining. Click here to learn more about the museum renovation project.